one vision | Sonic Smash-Music! The Swedish rock trio known as One Vision have released their highly awaited debut video, “I Want You.” The video was shot on-location at Bohus Fortress, built in 1308 on the old border between Norway and Sweden, from which castle the surrounding county takes its name. The video has been produced by Joakim Poromaa Helger. 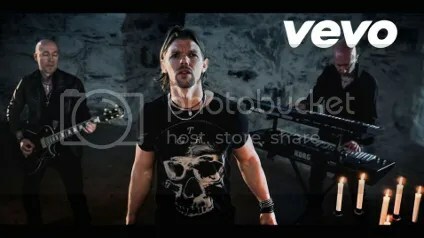 Exciting, melodic, and bearing the tale of a young noblewoman and her sworn protector, “I Want You” is a rock video which hearkens to the beat of romantic history. One Vision are guitarist Roger Pettersson, keyboardist Pia Pettersson and lead singer Stefan Palmberg. They have cited as main artistic influences such legendary bands of the rock genre as Whitesnake, Journey, U2, and fellow Swedish crew, Europe, as well as their musical contemporaries from the Netherlands, Within Temptation. As might be surmised, One Vision’s own sound is a blend of the above with certain key similarities making them stand out from the rest. Their blend of soaring electric guitar and agile, dynamic keyboard sounds is reminiscent of Europe’s early work, while the overall production, narrative lyrics and symphonic rock feel are closer to those of Within Temptation. Many of One Vision’s songs are inspired by a Gothic or Medieval sound and their lyrics are often narrative. The opening bars of “I Want You” seamlessly connect One Vision’s brand of rock music to the music of lute-playing minstrels in the Middle Ages. One Vision’s current official bio describes them as a “soft hard-rock band” from Gothenburg. The band was started in 2012 by guitarist Roger Pettersson and lead singer Stefan Palmberg. Roger started his music career in the early 1980s and has since toured with many different Swedish bands while sometimes working as a studio musician. In 2012 Roger began for real to produce his own songs and started One Vision with Stefan. Stefan has always had a special love for music and in particular towards the rock genre. At the age of 14 he joined his first group of fellow rock lovers as a drummer. It was several years later that he realized his potential as a singer and the urge to develop as one. Since then he has played with several other bands and musicians before finally meeting Roger and joining One Vision. The official “I Want You” debut video by One Vision is available for viewing online worldwide.